The Platinum American Eagle Proof has been one of the popular choices among platinum investors. The United States Mint has minted the Platinum American Eagle Proof since 1997. The Platinum American Eagle Proof is a collection series of four coins. The coin bears the distinctive designs of Augustus Saint-Gaudens rendition of Liberty, recognized as one of the worlds most beautiful designs, and sculptor Miley Busieks equally majestic golden eagle scene meant to symbolize family tradition and unity. The obverse or heads side of the proof coin shows Liberty with flowing hair and holding a torch in one hand and an olive branch in the other. The reverse or tails side of the coin has an image of a male eagle carrying an olive branch and flying above a nest with a female eagle and her hatchlings. As is traditional, the proof coins have production limits in place. The one-ounce, half-ounce, quarter-ounce and tenth-ounce coins may be purchased separately or together in a four-coin set. From 1936 the US mint started minting coin proof sets. They started with nickel, silver shifted to gold and slowly today they are minting even in platinum. Most of the people buy all these metal or bullion products for investment purposes. 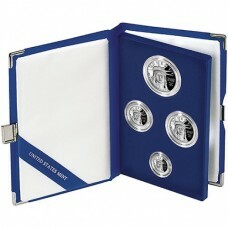 Platinum American Eagle Proof Set is a good way of investing money. The first Platinum American Eagle Proof Set was minted in 1997. It was engraved by United States mint sculptor-engraver Mr. John Mercanti. The obverse of this coin had Lady Liberty which is symbol of vigilance and faithfulness towards the duty. The words “Liberty” and “˜In God We Trust” were embossed on it. On the reverse side it had male eagle. In 2007 to celebrate 10th anniversary of the platinum eagle series the US mint minted one proof coin and one enhanced proof coin. This was the first time the mint gave importance to the reverse proof. The sale of this special proof coin ended in 2009. 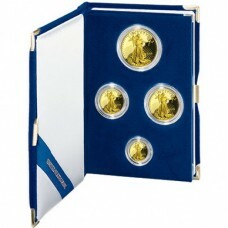 A coin proof set is a set which is specially prepared and polished in a die. It is hand polished for a final touch. They are struck for two to three times to get the finer look. These coins are not to be circulated. They are meant for the collectors and investors. The ePlatinum American Eagle Proof Set has 4 coins in it. All of them had “W” as a mint mark. W stands for West Point. All the uncirculated coins of American eagle in gold, silver and platinum has been minted here. 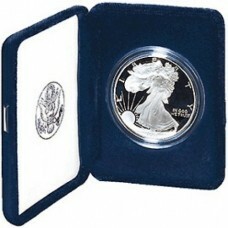 Platinum American Eagle Proof Set is usually minted in limited quantity. It require higher production cost due to extra efforts, labor and fine quality. Price of these coins are higher than all the other single coins. Many users buy a single coin to collect a set of those coins. They are sold by the US mint directly or through their authorized dealers. 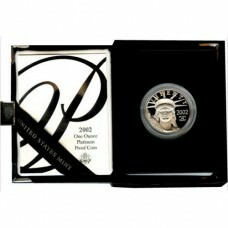 Due to heavy demand all the 2009 proof coins are sold out in a few days after they came into the market. Coin collectors and investors wait for the US mint announcements regarding the date of these coins sets. Today platinum is the most expensive metal. Many people buy this set as a matter of investment which they can use at the time of crisis. Because of the rarity of the Platinum American Eagle Proof Set coin proof sets, you can get any of the old set for the higher price than that of the current market price of the platinum. *An Official Certificate of Authenticity accompanies each American Eagle Silver Proof coin. Gold American Buffalo was created to compete with the Gold Canadian Maple Leaf. Production of the Gold American Buffalo 24-karat gold coins were authorized by Public Law 109-45 dated December 22, 2005, also referred as the Presidential $1 Coin Act. Gold American Buffalo Proof Coins are the first .9999 minted 24-karat gold coins ever struck by the US Mint. Gold American Buffalo coins obverse and reverse designs feature images originally prepared by noted American sculptor James Earle Fraser, once a student of Augustus Saint-Gaudens, for Americas 5-cent coin (nickel). The Native American depiction on the coins obverse is believed to be based on three different American Indians. The designer named two of the American Indians who modeled for Fraser as he sculpted the coin before his death. They were known as Chief Iron Tail of the Lakota Sioux and Chief Two Moons of the Cheyenne. Although many have claimed to have had a sitting with Fraser for this design, he could not recall the name of the third person and satisfactory documentation has not yet been found to identify that individual. In the first year of the coins issuance, 1913, there were two distinct varieties, the first showing the bison on a mound and the second with the base redesigned to a thinner, straight line. Gold American Buffalocoins bear the original Fraser Type I design. American Buffalo Proof coins are the first .9999 fine 24-karat gold coins ever struck by the United States Mint. The term proof refers to a specialized minting process that begins by manually feeding burnished coin blanks into presses fitted with special dies. Each coin is struck multiple times so the softly frosted and highly detailed images seem to float above the field. Gold American Eagle Proof coins were first minted in 1987. the United States Mint has annually minted the Gold American Eagle Proof since. 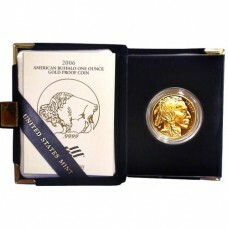 The Gold American Eagle Proof is a collection series of four 22-karat coins. Each of the 4 sized collector gold proof coins bear the W mint-mark to indicate where they were minted. West Point is the facility responsible for the entire family of American Eagle proof and uncirculated coins in gold, silver, and platinum. The coin bears the distinctive designs of Augustus Saint-Gaudens rendition of Liberty, recognized as one of the worlds most beautiful designs, and sculptor Miley Busiek’s equally majestic golden eagle scene meant to symbolize family tradition and unity. Gold American Eagle Proof Sets are specially minted for gold investors and collectors or used as a gift for special occasions. These gold coins are not for circulation purposes or bulk trade as seen in relation to gold bullion. The blanks for Gold American Eagle Proof coins are specially made so as to mint proofs that are highly polished before they are struck. Even the dies are specially prepared and polished thoroughly before the striking process begins. 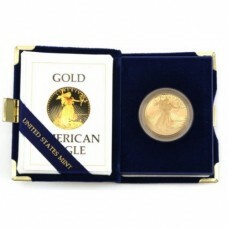 Gold American Eagle Proof coins are produced in very limited amounts so they are very rare. The premium value of proof coins have been consistent on increasing their value above the spot price of gold making them a recognized investment. Silver American Eagle Proof coins like its gold counterpart the Gold American Eagle Proof has been minted by the United States Mint annually since 1987. The Silver American Eagle Proof is available only in one-ounce coins. Each silver proof coin bears the W mint mark to indicate they were minted at West Point- the facility responsible for the entire family of American Eagle proof and uncirculated coins in gold, silver, and platinum. The Silver American Eagle Proof bears the distinctive designs of Augustus Saint-Gaudens rendition of Liberty, recognized as one of the worlds most beautiful designs, and sculptor Miley Busiek’s equally majestic golden eagle scene meant to symbolize family tradition and unity. The obverse or heads side of the proof coin shows Liberty with flowing hair and holding a torch in one hand and an olive branch in the other. The reverse or tails side of the coin has an image of a male eagle carrying an olive branch and flying above a nest with a female eagle and her hatchlings. As is traditional, the proof coins have production limits in place.